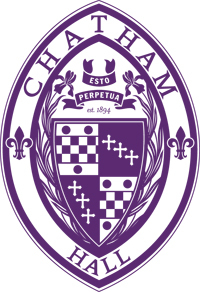 Established in 1894, Chatham Hall is an independent, college preparatory boarding school for girls in grades 9 – 12. Founded as the first girl’s Episcopal school in southern Virginia, we are a community grounded in the values of the Episcopal tradition. Chatham Hall prepares girls for college and for productive lives. Our rigorous educational program encourages intellectual growth, creativity, and personal responsibility. We foster the intellect and character of each student and, through our Honor Code, live in a community of trust. Grounded in its Episcopal heritage, the school welcomes students of all faiths and backgrounds. All members of the Chatham Hall community, students, faculty, administration and staff, are committed to cultivation of honor, integrity, and responsibility through the Purple and Gold rule and a vigorously embraced Honor Code – I will not lie. I will not cheat. I will not steal. I will report all infractions of Honor. Our opening day enrollment of 168 includes girls from 23 states and 14 foreign countries, including Austria, Canada, China, Colombia, Germany, Jamaica, S. Korea, Mexico, Nigeria, Russia, Rwanda, Spain, and Vietnam. With 90% of our students residing on campus, Chatham Hall’s boarding population is among the highest percentages of all college preparatory girls schools in the United States. 85% of our faculty, staff, and administration reside on campus. Chatham Hall is situated on 362 acres located in the Piedmont of Virginia, next to the town of Chatham and within 2 hours of Raleigh-Durham, Greensboro, and Chapel Hill, NC to the south and Lynchburg, Roanoke, Charlottesville, VA to the north. Chatham Hall is a member of the Blue Ridge Conference. Students are required to participate in a team sport or scheduled physical activity every season. 10 varsity sports are offered: basketball, cross-country, field hockey, golf, lacrosse, riding, soccer, swimming, tennis or volleyball. Dance and high-level conditioning are also available. A variety of accomplished women are brought to campus each year to participate in student-led programming. Presenters have included the first president of Ireland, Mary Robinson, 2011 Nobel Peace Prize recipient Sirin Ebadi, former Prime Minister of Pakistan the late Benazir Bhutto, the President of Liberia Ellen John-Sirleaf, choreographer and Director of the Alvin Ailey Dance Company Judith Jamison, international tennis star Venus Williams, movie executive Sherry Lansing, journalist and author Katty Kay, actor and humanitarian Ashley Judd, Rehsma Saujani, founder of Girls Who Code, and Sallie Krawcheck, CEO and founder of Ellevest, a digital financial advisor for women. One member of the Class of 2018 has been recognized as a Commended Student in the National Merit Scholarship competition. 20 girls in the Class of 2018 (72%) earned merit scholarships totaling over $2,900,000. In 2016 Chatham Hall placed 1st and 2nd in the statewide Test of Engineering Aptitude, Mathematics and Science. Students are encouraged to pursue independent study for course credit through Discover Challenges, which involve developing a curriculum, securing a faculty mentor, and conducting research. These courses can lay the foundation for an iQuest, where students apply for a grant to continue their research away from campus. Chatham Hall’s Interscholastic Equestrian Association team qualified for National Finals in 2015, 2016, and 2018. Competing against 1,200 varsity teams nationally, we were named Reserve Champions in 2015 and placed 4th in 2016. Individual riders have qualified for National Finals every year since 2016. In 2017 – 18, Chatham Hall students devoted over 3,000 hours to non-required community service hours. Chatham Hall’s service learning opportunities include spring break trips to India and South Africa in alternate years. Begun in 2005, about 1 in 4 Chatham Hall girls has been to South Africa. Study Abroad experiences are encouraged through the Student Diplomacy Corps and faculty-led travel projects. Destinations have included France, Mexico, Spain, Japan, Italy, China, Cambodia and Nepal. Students may also participate in intensive, 3-week language programs to Spain and France in the summer.